I find myself in West Chester a lot these days due to business. And every time I meet up with one of my clients, I pass this local bar called the Blarney Stone located on West Chester Pike. From the outside it looks like a quaint little pub, and based on the locals’ testimonies, has the best wings. So, I thought this was a good enough reason to stop in for some grub. I took a seat at the end of the bar, ordered my drink, asked for a menu, and struck up a conversation with the bartenders. 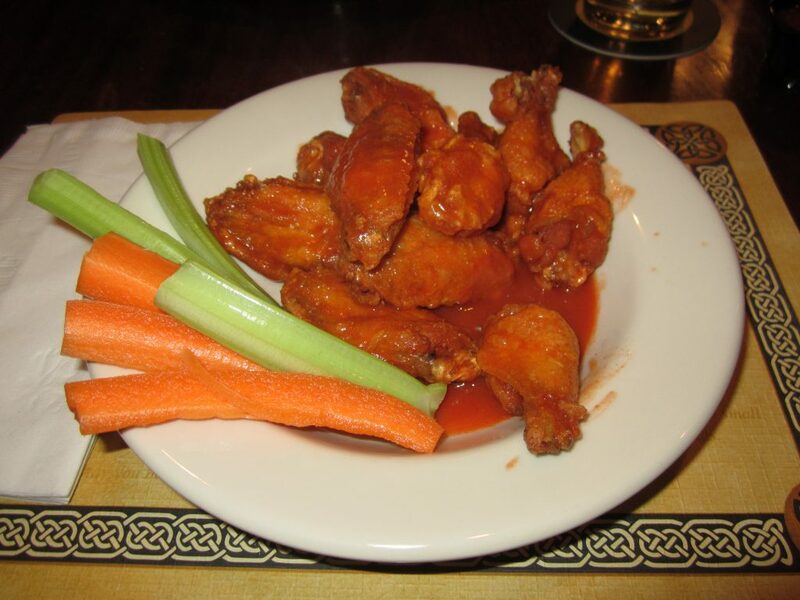 The specific topic that stood out in my memory was the one the tender referred to as “Wing Roulette.” According to the story, a group of friends come in on a routine basis and orders a plate of twenty wings. They order all of them “Hot” with the exception of three. These three get a coating of the “Suicide” sauce and are mixed into the rest of the wings. The plate is then served, and the group randomly selects their wings in hopes of not getting the “Suicide” ones. While I’m enjoying this story, I glance to the wing section of the menu and see the following phrase: “Chester County’s most famous wings.” Now if you haven’t figured this out about me yet, I tend to be a little harder on the review criteria at places that make claims like this one. Reason being: Own up or shut up. If you brag about your wings, they better be good. And there is only one way to find out…so I had them Bring The Wing! Out of the six sauces, I ordered in the middle and got the “Mild” with a side of “Hot.” According to the menu, I should expect “fresh chicken wings fried crispy golden brown then tossed in our own special sauces.” But that wasn’t what was served. At first glance, I noticed how incredibly small the pieces were. Probably the smallest I have seen in a while. The wing sections were slightly larger than the drums, but to give you an idea, I finished the drum in one small bite……………………………………..RIGHT?? That in itself is unacceptable, but let’s move on. The temperature was very hot as it just came out of the fryer which was nice, but the so called “Fresh” meat was nothing more than a frozen wingette served to yours truly. The look, feel, and taste reminded me of the frozen chicken wings that I get at the store when I’m doing some home frying. And to top it off, the “Special” sauce that they allegedly made themselves was fricken “Franks” (or at least I’m 98% sure it was)! So it seems that everything related to the wings were store bought, as well as the wool that was obviously pulled over all the locals’ eyes who claim these wings to be the best. This was a great disappointment as I REALLY loved this bar’s atmosphere, the staff’s friendliness, and the quick service. But when it comes to their wings, I will say to save your money and make them at home for half the cost. If you take a look at the rating above, the only reason it scored this high is soley because of the “Franks Hot Sauce” and I happen to like “Franks.” Take that away, and they were just plain pathetic. I will return to this place for a great time and good people, but I will have to order something else off the menu, as the wings just did NOT make the grade.